Popcorn is a much loved snack by both the young and old. Whether it's at the theater, a party or just at home, this makes a great treat to munch on. Like many other snacks in the market, these come in all types of flavors. Homemade popcorn can be given the same fancy tastes through the use of popcorn seasoning. Seasonings refer to anything that will add taste to food, such as salt, pepper and herbs. The term popcorn toppings can often be used synonymously with popcorn seasonings. Toppings are garnishes used on food that add both decoration and flavor. Since the flavors applied on popcorn can function both as seasoning and topping, the terms are freely used in exchange with each other. The main purpose of popcorn toppings is to make plain popcorn taste better and add diversity to this basic snack food. For those who are health conscious, the use of seasoning does not make this treat much less nutritious. As a whole grain, it contains fiber and carbohydrates and does not have any fat, sugar or salt. Of course, the use of popcorn seasoning can add a small amount of these and other components. However, due to the small amount contained in most toppings, the nutritional value of popcorn is hardly affected. Even with the use of fats, such as butter, this snack still has relatively low calorie content. As a matter of fact, popcorn can be made even healthier depending on the choice of topping. For example, ingredients such as garlic, lemon and nuts all have excellent nutritional benefits. 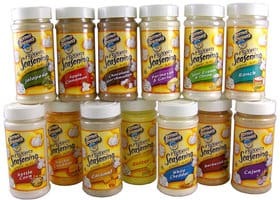 Popcorn seasoning comes in many different flavors, ranging from the classic salty to sweet and savory. These various tastes can be applied to popcorn through toppings in the form of powders, liquids and sprays. Perhaps the most popular and the most commonly used flavorings for popcorn, powders, come in a wide range of flavors. These are simply sprinkled onto the popped kernels and mixed by tossing or shaking. These leave popcorn with a dusting of flavor that will instantly change the taste. Powder seasonings are easy to find and readily available in stores. Regular kitchen ingredients like herbs can also be used as powder seasoning. There is a wide variety of powdered popcorn seasonings in the market. Kernel Season's is one of the leading brands which offer many different flavors. You can take your pick from sweet toppings such as the familiar Kernel Season's Popcorn Seasoning-Caramel to something savory like Kernel Season's Popcorn Seasoning-Barbecue . All of these powdered toppings are made with good health in mind, so it may be gluten free, 0 fat or low sodium. Salt, such as Morton Salt Popcorn Salt is another classic powdered type of seasoning. This is made especially for popcorn and has finer granules than the usual salt for cooking, making it stick to popcorn better. Like powder seasonings, these add flavor to popcorn, except it comes in a fluid form. These are also fairly easy to use, since all that needs to be done is to pour it over the popcorn and give it a quick mix, although it may be a bit messier. Liquid seasoning coats the popcorn and may offer a thicker covering of flavor compared to powders. These will also stick better because of its liquid properties. However, excessive use can lead to soggy popcorn. In terms of liquid popcorn toppings, butter is the most common flavor. Wabash Valley Farms which is a leading brand for popcorn supplies offers a Buttery Popcorn Topping . It gives popcorn a flavor and texture that is just like that of movie theater popcorn. Like other liquid toppings it often works well with salt. These are basically liquid seasonings which come in specialized containers such as aerosol cans or spritz bottles. This special packaging allows the liquids to be diffused and the smaller particles attach themselves to the popcorn. Such a flavoring method allows the popcorn to become flavored with just the right amount of topping and proves to be less messy than powders or oils. Similarly, most popcorn spray seasonings come in butter flavor, just like Crisco Butter Flavor Cooking Spray . This is easy to use and gives you butter flavored popcorn without any mess. It also does not need any additional salt since it is amply seasoned. Of course, other flavors such as Garlic Juice Spray or Pour from Garlic Valley Farms can also be found. Made from organic, kosher garlic bulbs it provides the right flavor while being gluten free. Despite the many different choices for popcorn flavors in the market today, traditional popcorn seasoning has not taken a back seat. A good number of people still enjoy good old flavors such as plain salted or buttery smoothness. Traditional flavors are a great way to enjoy popcorn in the simplest way - without any frills, just some delicious popped kernels with a little surprise in it. With its versatility, popcorn can easily be flavored with almost anything, including sweet popcorn seasoning. Those with a sweet tooth are sure to enjoy munching on this delicious treat. The great thing about this kind of topping is that you can make the popcorn just as sweet as you want. It can also be used together with other seasonings such as salt, to come up with a mouth watering mix of flavors. Like other toppings, this can be applied after cooking and is usually in powder form. Flavors such as butter and caramel make great popcorn but for those who want something a bit different, savory popcorn seasoning works well. Cheese is probably the most popular of all savory toppings, however there are many other different flavors that can be enjoyed. These range from familiar tastes such as nacho cheese and white cheddar to more unique combinations such as coconut curry and beer. Savory popcorn toppings are a great way to jazz up a bowl of popped kernels thanks to the many interesting flavors that it comes in.